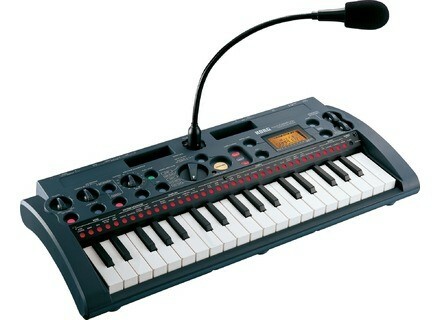 Roland Topel's review"Easy to use Sampling Keyboard"
My opinion: Do not pay more than 100€, this sampler is a toy. revega's review"Small, but effective, pocket sampler"
Effects are of good quality, but they are also limited: : You can only use one effect at a time, which in my opinion is a pity. So, using a compressor or reverb + looping in real time on the fly is impossible! You will have to choose. If you want effects and be able to work with the samples in real time, you'll need and external effects processor. The sequencer is very handy (especially to control expanders via MIDI), even if limited to two tracks. I use the microsampler basically as a synthesizer and not really as a sampler. I can sample my keyboards and, thus, have something compact, light at hand, which spares me from having to carry all my gear around with me. I also use it to create sounds from different sound source that I can play with a keyboard, that way I can get very particular and unique ambiances and sounds. That's certainly something you can do from a DAW, but the microsampler has an immediate feel to it that is very nice to create things. It's a fabulous tool to experiment with. - The controls lack precision: The one that allows you to select the playable sample on the keyboard is not very practical, especially live (2 +/- navigation buttons would've been perfect). - I find it hard to use for sampling on the fly (for beatboxing and similar). Even if possible, I wouldn't recommend it for this use. - As I wrote above, you can only use one effect at a time! It's a real pity. - No octave +/- buttons, which is somewhat of a handicap for what I do. - Sequencer limited to two tracks. Many people criticize the memory limitation. To be honest, given that you can transfer banks to your computer and make backups the same way, I can't follow the criticism. 8 banks of 36 samples, 16 patterns, that may seem limited if you ONLY use the microsampler in your set, but together with other synths and a computer, the memory is more than enough for live applications. It has never annoyed me. For studio use it's totally irrelevant. In the end, this keyboard serves me well and constitutes a truly awesome sound creation tool. It is limited, like all tools, but it suits my needs perfectly. I would definitely buy it again with my eyes closed. The memory is indeed short, but you learn to make short loops over time and it's not bad. Interesting effects, not many controls, but it has the basics. Excellent manual, as usual with KORG. The included editor is really handy, drag-and-drop samples, you can do transfers bank per bank or the bulk of the memory. It's not really high-end, but it's all right. If you are expecting apogee converters for less than 300 euros, you are in the wrong place. I've been using it for a little over a month and I think I master about 80% of its functions already. I've had very similar samplers, the MPC500 and Roland SP505. To be honest, this one is the most practical and user-friendly. I don't do live gigs, but I think it must be great for that. You load your bank at home and you are ready to go on stage. The same goes for people who make ambiance shows. It's an EXCELLENT value for money now. 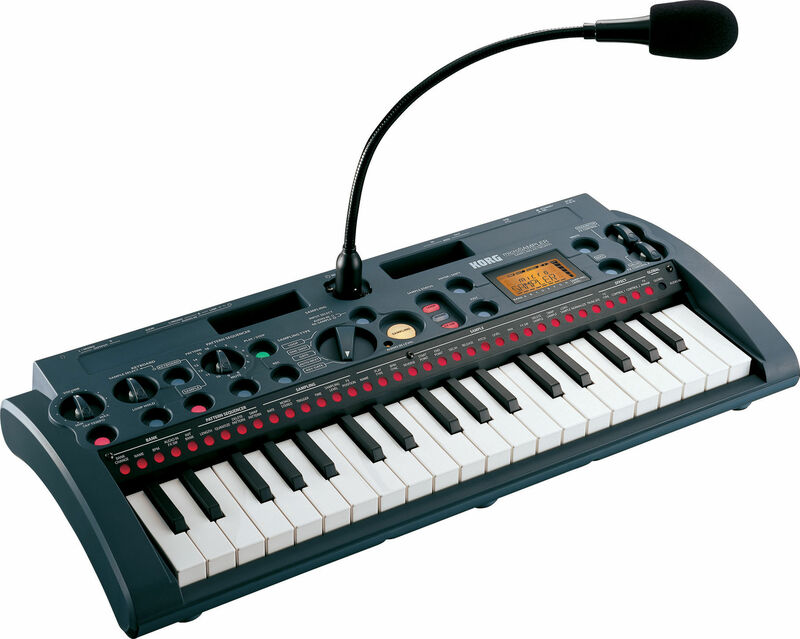 I say now because Korg decreased the price of the microsampler after several months and you can find it new for less than 300 euros. For that money it's more than all right. I don't regret my purchase in any way. Menestrel de malheur's review (This content has been automatically translated from French)" Not a bad concept"
ok I find the concept interesting, we regret the internal memory a bit short, besides that here is a very small sample pleasant to use, very simple and intuitive enough to call or put an idea into a flat time at all, nice portability with batteries that last about 3hrs 30 in heavy use, a nice face and a lightness hallucinatory effects are good quality. It is well worth its price in any case, once successful korg. MICRO DOES A WONDER AND IS QUALITEE EXXELLENTE. 18 DAYS A PEARL .THE TRUNCATE SOFTWARE ALLOWS YOU TO CREATE YOUR LOOP SAMPLES THE SPEED OF FLASH EACH BANK MAY SAVE EACH SAMPLE ... YOU CAN SAVE THOUSANDS OF BANKS AND YOU MAY SAMPLES LOAD A MAXIMUM OF 8 BANKS AT ANY TIME. THE SEQUENCER 16 TRACK IS EFFECTIVE AND INTERNAL MEMORY IS DEDICATED TO THE LATTER IS ENOUGH hefty.